I’m checking in again this week with a wip post on my Hermiones Everyday Socks . I’m hoping to concentrate on this and get the first sock done and the second started. I am as far as the instep and probably not that far off the toe decreases. 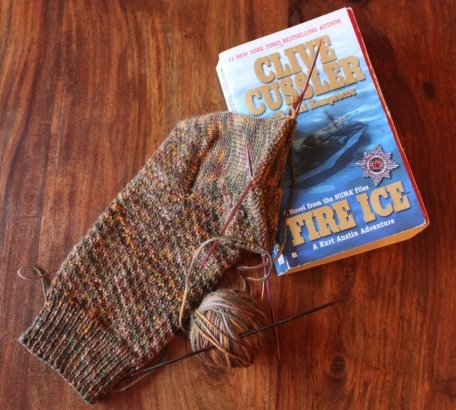 I’m also signing up to Ginny’s Yarn Along this week and as you can see I’m reading Cliver Cusslers Fire Ice, this book is part of my Whats in a Name 6 for the category of Fire. This is a re read for me. It was in my to read pile but I suspected I had read it before and yes indeed I have but decided to re read it and I’m glad as I’m enjoying it again which I didn’t think I would. This entry was posted in Uncategorized and tagged Hermiones Everyday Socks.. Bookmark the permalink. Your socks are coming along nicely Ruth, think come May Im going to have to start knitting a pair and when Im up your way in June, I can get you to explain the heel flap thingy while Im there, no better way to learn than hands on approach. That yarn is knitting up just beautifully in that pattern. Gorgeous! I just ADORE this sock pattern. I can't wait to see the finished pair! I've made those socks and I love the pattern! That looks like a good, warm sock! This is one of my favorite sock patterns! I wear my Hermoine socks more than any other I've knit. Your version are beautiful. Oh, I do love those socks but it's probably because you're such a good knitter. If I did them they wouldn't look anything like that! LOL! Love your yarn choice too!My camera ran out of batteries so I can't blog without them…no pictures so I'll run out tomorrow and get some….my new charger didn't work! Dang it! Now I have to send it back…oh well…I tried.TTYL!